Side dish: Joon Ho likes to quote philosophers, but does he know what they liked to eat? In case you’d like to delve into this important question, check out this review of Michel Onfray’s Appetites for Thought: Philosophers and Food on Pop Matters. 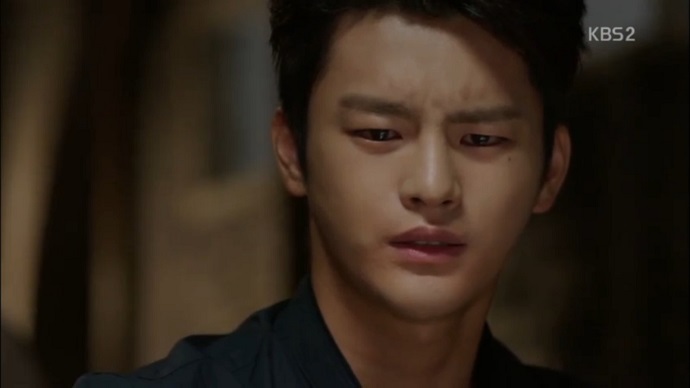 Looking at the envelope containing the possible identity of a murderer, genius criminal profiler, Lee Hyun (Seo In Guk) hesitates. Instead of reading its contents, he flashes back to his interactions with coldblooded attorney, Jung Sun Ho (Park Bo Gum), where Sun Ho repeatedly tried to get to know him better. Hyun’s instincts tell him that Sun Ho is his missing younger brother, Min, and also that he is the murderer, but he doesn’t open the envelope to find out. At the police station, detective Cha Ji Ahn (Jang Na Ra) goes through the footage of the interview with the teenage murder victim’s adoptive parents. They do not deny that their adoptive son’s death was convenient for them, and dare Hyun to produce evidence of culpability in his death. Ji Ahn turns to the CCTV footage of the beating that killed him, and notes that the victim, and the unidentified passerby (whom we know to be his mother) locked eyes at one point before the passerby walked away. Back at his desk at home, Hyun finally opens the envelope and takes out its contents. A picture falls out, face down, but he leaves it there, and goes through files on the victims of the various murders where the bodies disappeared. In each case, the victim had abandoned someone in the past. Hyun theorizes that it sounds like Min is punishing others for Hyun’s abandonment, killing him over and over in this way. When he finally turns over the photo and discovers that it’s Sun Ho, Hyun breaks down crying and beats himself on the chest. Elsewhere in the city, Sun Ho gets into a car and drives off. Hyun, meanwhile, thinks back to his words during the interrogation of the victim’s adoptive parents, detailing the law under which the parents could possibly be charged if there was evidence. Hyun recalls the look on Sun Ho’s face as he comes to the conclusion that the adoptive parents had thrown their son away, and realizes that the couple are in danger. He tries to call Sun Ho, to no response, then goes over to the parents’ house. Hyun gets no answer there either, but finds a card with a picture of a radio on it and the Roman numeral 6, matching the cards that he’d received over the years when the murders were being committed. 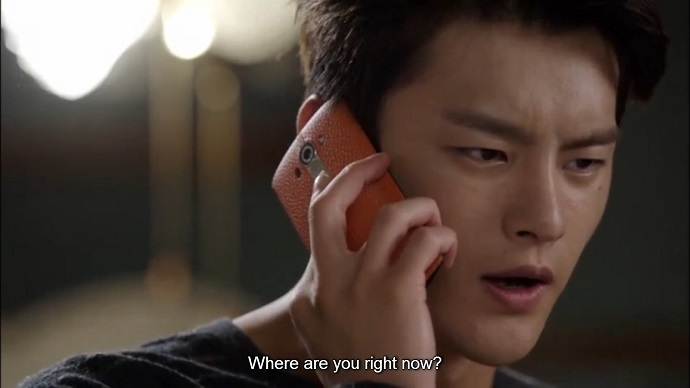 Realizing that another murder is on the way, Hyun calls his art dealer friend, Bong Song to find Sun Ho’s address. He then calls Ji Ahn, who is at the police station with geeky cop, Choi Eun Bok (Son Seung Won), and instructs her to call the victim’s parents. Hyun races over to Sun Ho’s house, to find no one home, but seeing a room full of paintings is enough to convince Hyun of the truth, that Sun Ho is Min. As Sun Ho comes in, Hyun turns around, in tears. Hyun asks Sun Ho if he is Min, but he knows the answer already; instead, he’s heartbroken because he’s too late to save him. 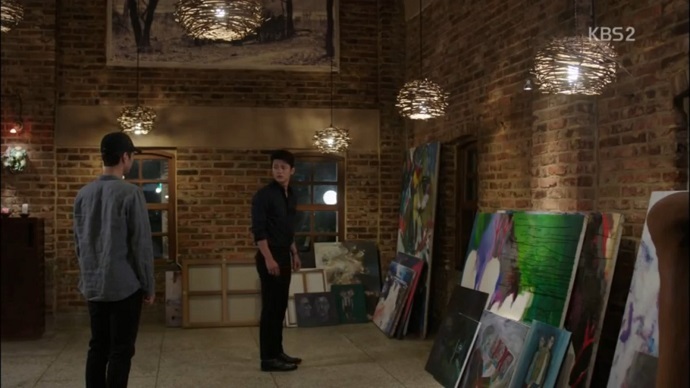 Sun Ho is obviously affected, but he brushes Hyun off, and goes to his painting instead. Hyun grabs his hand to check if he’s injured, but Sun Ho shrugs him off again. Finally, Hyun asks about the victim’s parents, but Sun Ho seems genuinely confused by the question. Hyun asks again, telling Sun Ho that they’re not worth destroying himself over. But, Sun Ho states that he was already broken, from the moment Hyun abandoned him. Hyun denies abandoning him, but Sun Ho is too distraught to listen. He accuses Hyun of abandoning him and sending him to serial killer, Lee Joon Young (Do Kyung Soo, or EXO’s DO). Hyun denies it, but as Sun Ho continues, the memories come back of himself as a child telling Joon Young that even though his father thought that he was a monster, it was Min who was the real monster. Both brothers are in tears, stricken, but it’s a K-drama, and so when the phone rings, Hyun answers it. Luckily, it turns out to be Ji Ahn reporting that the victim’s parents were at home. When she demands to know what’s going on, he simply tells her that she’s done a good job and hangs up. Sun Ho confesses that he didn’t feel like doing anything to them today, and Hyun asks him to just kill him instead, since he’s the one that Sun Ho wants dead. Sun Ho agrees, but as Hyun leaves, both brothers are crying their eyes out. Back at his home, Hyun can’t face Ji Ahn’s questions, and promises to tell her everything later. She tells him that he has to tell her, but leaves him alone for the time being. Hyun, instead, falls asleep at his desk, and has a nightmare where he finds Min as a child burying something. As Min turns around, he becomes the adult Sun Ho. Lucky for Hyun, he wakes up to find Ji Ahn sitting on the desk and sleepily holding his hand to comfort him. As he wakes up, Ji Ahn passes out, and he eases her down onto the desk. Hyun tells the sleeping Ji Ahn that his brother, Min, might be a murderer and that he doesn’t know what to do. He trails off as he asks her to do something if he ever runs away, and leaves her to sleep on the desk. As he goes, Ji Ahn opens her eyes and sits up. In a dark room, a mysterious man contemplates a picture of Hyun. Meanwhile, Sun Ho jogs past the police guarding the home of the victim’s parents, then goes home. His next visitor turns out to be medical examiner, Lee Joon Ho (Choi Won Young), whom we now know to be the grown up Joon Young. Joon Ho points out that Sun Ho didn’t take care of the victim’s parents, and Sun Ho shrugs it off. Instead, Sun Ho asks if Hyun really did throw him away. Joon Ho replies that it was more convenient for everyone if Sun Ho was left with him. 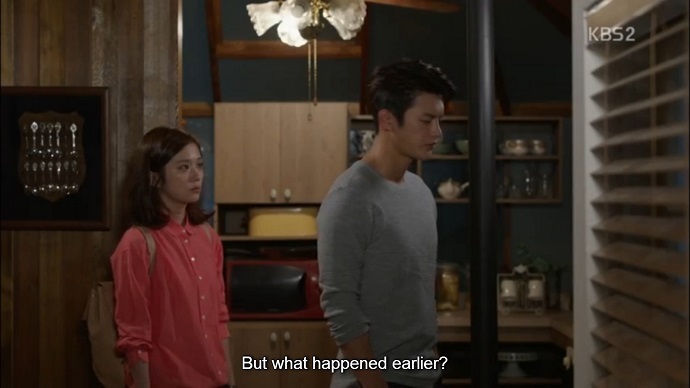 Over breakfast, Ji Ahn confesses that she heard everything Hyun said last night, but Hyun tries to avoid any further discussion of the subject. Ji Ahn won’t let him, believing that the reason he told her what he did was because he was asking for help. Though she doesn’t know how she can help yet, Ji Ahn is positive that this isn’t something he can handle alone. Hyun wants to know if she is inquirig as a cop, and Ji Ahn denies it; she wants to know as someone who is close to Hyun, but it’s inevitable that she’ll need to know as a police officer, eventually. She asks if he’s found his brother, and he confirms it. She asks if his brother was taken away by Joon Young, and Hyun confirms it. But, when she asks if his brother has become a murderer, Hyun still doesn’t know for sure. The next day, at the police station, Eun Bok shows Ji Ahn and team leader, Kang Eun Hyeok (Lee Chun Hee) the fruits of his labour: a clear picture of the bystander on the CCTV video. We already know that it was the victim’s mother, but now, they have enough evidence to arrest the mother for abuse, since her negligence caused her adoptive son to die. The mother is quickly arrested, but Ji Ahn is more preoccupied with the mystery surrounding Hyun. She thinks back to their last conversation, where Hyun refused to tell her the identity of his younger brother. 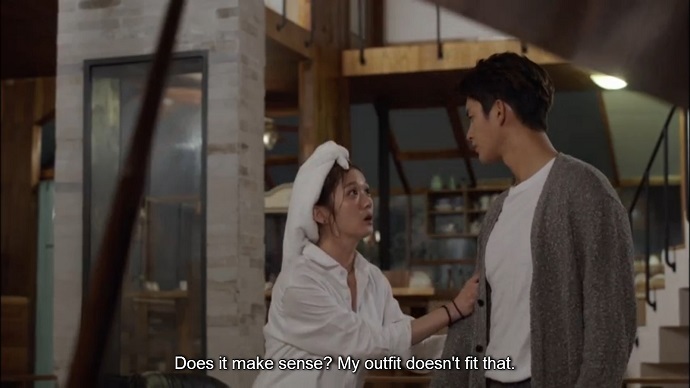 When he goes on to say that Joon Young had always been around them, Ji Ahn quickly realizes that Hyun suspects that Joon Young is someone they both know. Instead of confirming her suspicions, Hyun takes her into his basement, and plays Joon Young’s tape for her. She’s horrified, but more at the fact that Hyun was stuck in the basement at a young age. Hyun explains that if he told his father that Min was the monster, his father would have locked up Min instead. Hyun blames himself for betraying Min’s secret to Joon Young, thus destroying any chance that Min had of growing up with him. When Ji Ahn hugs him for comfort, Hyun thanks her and kisses her on the forehead. Back in the present, Ji Ahn tears up again. Hyun wanders around Sun Ho’s studio, much to Sun Ho’s annoyance, and announces that he’ll continue doing it as he pleases. Sun Ho is skeptical of his intentions, but Hyun tells him that he only wants one promise from him: that if he kills someone, it will be Hyun rather than anyone else. Sun Ho looks sorely tempted. In an abandoned building, the mysterious man from earlier walks away from what looks like a corpse. Back at the police station, veteran cop Son Myeong Woo (Min Sung Wook) is annoyed at having to accept another package for Hyun. He convinces the delivery man to leave it with him, then tosses it on Hyun’s desk. As he does, the envelope falls open and pictures of the corpse shown in the previous scene come tumbling out. Myeong Woo grabs a photo, and sends cheerful rookie, Min Seung Joo (Kim Jae Young) after the delivery guy, but to no avail. Meanwhile, Eun Hyeok reads the back of one of the photos, a passage vowing to visit the crimes of the father onto the sons. 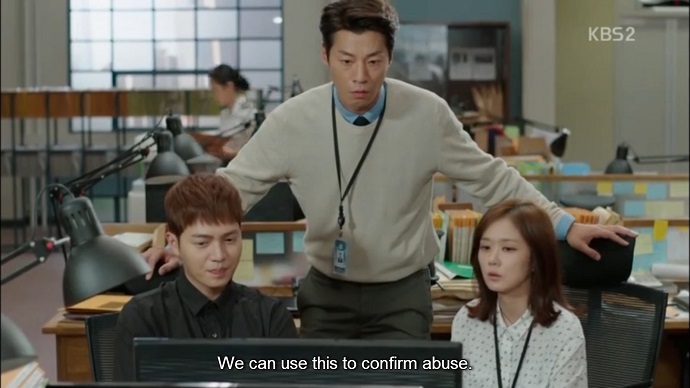 When Eun Bok points out that Hyun’s father was a police psychologist, Myeong Woo tells him to look up anyone he put away who may have just got out. In Sun Ho’s studio, the same envelope sits on a pile of his mail, but Sun Ho isn’t there: instead, he’s having tea with Joon Ho. Joon Ho asks Sun Ho whether he wants to be reconciled with Hyun, and it seems clear that Sun Ho does. Joon Ho was against letting the two of them meet, but has changed his mind. Before he can elaborate on his thought, his phone rings, calling him to the case of the corpse in the abandoned building. Once there, Joon Ho learns from Eun Bok that the corpse belonged to a homeless man from the area, who was possibly killed as a sacrificial lamb. When Eun Hyeok lets slip that photos of the corpse were sent to Hyun, Joon Ho wonders why Hyun isn’t at the scene. Hyun, meanwhile, is snoozing in a chair at home, while Ji Ahn pesters him to tell her the identity of his brother, and the person he suspects of being Joon Young. He doesn’t even open his eyes while she yells, but asks her what if the person who was killed was someone who deserved to die. She refutes this idea, since no one on earth can make that decision. Instead of a response, Ji Ahn gets a phone call from Myeong Woo, asking if she knows where Hyun is, and learns of the latest murder and the threat sent to Hyun. When she tries to rouse Hyun with this information, he’s barely interested and she has to bodily drag him out of his chair. At the police station, Eun Hyeok describes the possible culprit as a mafia killer, put away by Hyun’s father and seeking revenge. Hyun is barely interested in another threat on his life, and unconvinced by this story. He tells them to search for a better motive than the obvious one. 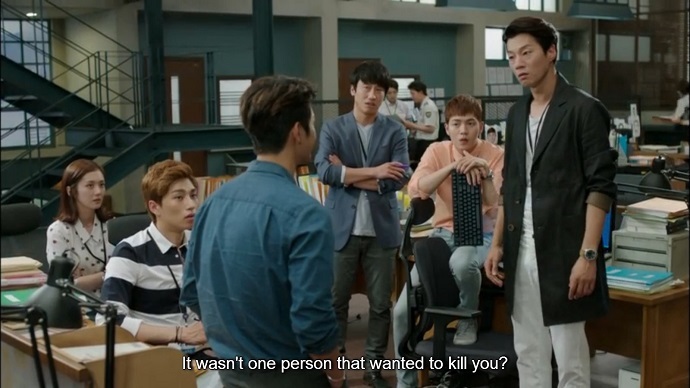 Hyun points the team at local newspapers for better details of the mafia killer’s arrest, then takes off, leaving the case in their hands, much to their confusion. Ji Ahn chases him and tells him that she’ll protect him and catch the killer. When he smiles at this, she stares him down, asking if he’s making fun of her. Hyun quickly wipes the smile off his face, and leaves. It turns out that he’s back to visiting Sun Ho, to tell him that he’s relieved that Sun Ho didn’t grow up as the known son of his father, Lee Joong Min. When Sun Ho asks him to explain himself, Hyun leaves it at that, and instead pesters Sun Ho to spend time with him. At his own home, Joon Ho goes through the notebook of Hyun’s father, Joong Min, and finds an article about the death of a suspect’s live-in girlfriend, with a note next to it expressing Joong Min’s guilt. Joon Ho grins evilly to himself. Ji Ahn comes home to Hyun’s house and gives him a gas pistol for defence against the killer. She reassures him with the knowledge that everyone is working hard to catch the guy, but Hyun’s only response is to smile at her. When she glares back at him, he drops the smile and hides behind his book. At the police station, Myeong Woo, Seung Joo, and Eun Bok giggle as Eun Hyeok takes a call from his worried father, Deputy Commissioner Kang. They put on straight faces when he hangs up, but he explains that his father has been overly concerned since Eun Hyeok’s stabbing incident. 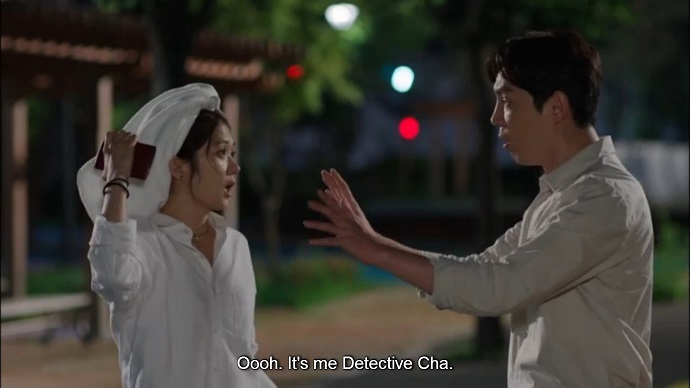 When the detectives regard him with amusement, Eun Hyeok changes the subject to whether Hyun lives alone, and wonders whether someone should keep an eye on Hyun at night. Eun Hyeok’s chosen candidates for Hyun’s protection are himself and Myeong Woo, and they show up at Hyun’s house shortly after Ji Ahn’s shower. Aware of how it must look, Ji Ahn decides to hide, though Hyun seems indifferent. As Hyun goes to let the two men in, Ji Ahn climbs out the bedroom window. 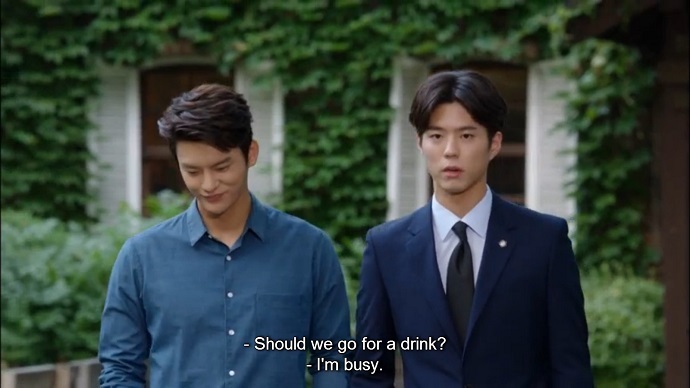 Meanwhile, Myeong Woo and Eun Hyeok wander around the house, suspicious of everything, but Hyun has a ready answer for everything. Stuck outside, Ji Ahn wanders the street, but soon realizes she’s being followed. When she turns around to confront her would-be attacker, it turns out to be Joon Ho. Instead of attacking, he claims to be scared of being attacked himself. But, Ji Ahn is not reassured, as she thinks back to Hyun’s revelation that he suspects someone they know of being Joon Young. But, Ji Ahn is the suspicious one, since Joon Ho is in his own neighbourhood, and Ji Ahn is wandering around with a towel on her head. Joon Ho makes them tea at his own home, but Ji Ahn’s suspicions are not allayed. As he blandly deflects her questions, Ji Ahn thinks back to Joon Ho’s past interest in Hyun. He lets her look around, but at the first closed door she spots, Joon Ho warns her off entering. Instead, Joon Ho drives Ji Ahn back to her apartment. In the car, she tests Joon Ho’s reaction by telling him about her missing father. When she confesses that she still entertains doubts about whether he’ll come back or not, Joon Ho quotes Kant, saying that happiness will come from a bud of hope. He follows that up by quoting Nietzsche, that hope is evil. Ji Ahn doesn’t like complex answers, and says so. From her words, Joon Ho wonders if having hope is too cruel. 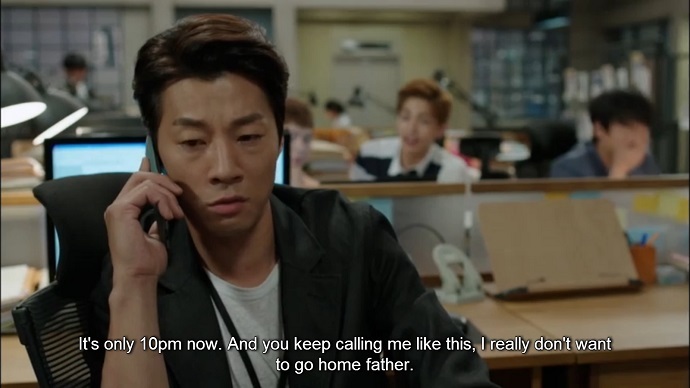 Back at Hyun’s house, Hyun gets a call from Ji Ahn, just as he tucks Myeong Woo and Eun Hyeok into bed. She tells him that Joon Ho drove her home, but hesitates to ask Hyun about him. Instead, she tells him how nice it is to be back in her apartment. After they hang up, Ji Ahn starts cleaning up her apartment, then opens a file box. She’s impressed with her own stalking as she pulls out a stack of pictures of Hyun. Flipping through them, she suddenly spots Sun Ho in the background of one of the pictures. Ji Ahn thinks back to her conversations with Sun Ho, about her being the second person that he had such a close interest in. She remembers Hyun’s admission that his brother had reappeared, and puts two and two together. The next morning, Joon Ho shows Sun Ho a picture of the possible culprit in the murder case, and current threat against Hyun. He tells him how the guy’s girlfriend accidentally died while they were on the run, followed by his brother. When he figures out that Hyun is under threat as Joong Min’s son, Sun Ho realizes why Hyun was glad that no one knew Sun Ho as Joong Min’s son. Sun Ho smiles to himself, but doesn’t explain why when Joon Ho asks. Joon Ho isn’t finished, however, and points out that killing Hyun is not an equal revenge. Rather, the culprit would be more likely to kill Hyun’s loved one, so that Hyun can have the same torment that he did. Joon Ho brings up Sun Ho as a possible candidate, but in the end, the two men calmly agree that the most likely candidate is Ji Ahn. When Ji Ahn sends Hyun an article about the case, Hyun comes to the same conclusion and figures out that Ji Ahn is in danger. He calls her to ask where she is, but before she can answer, she hears footsteps from behind her and turns around. Okay, I’m going to call it right now, and say that I don’t think Sun Ho is the murderer. It looks more to me like Joon Ho is trying to get him to kill for the first time, and that up till now, he’s been cleaning up after Joon Ho. Otherwise, why would he even consider that he could reconcile with Hyun? I mean, don’t get me wrong, Sun Ho is a coldblooded guy who only seems to care about two people, but I don’t think he’s the murderer. In fact, Joon Ho has more of a grudge against people who abandoned him than Sun Ho does. Hyun’s suspicions that Sun Ho has become a murderer seem more to be the products of Hyun’s guilt than the actual facts before him. But, enough of my pet theories. We spent more time this episode on revelations and their aftermath than we did solving crimes. The ending to the case of the teenager was so anti-climactic that I wondered if I’d missed something, and the intro to the mafia killer was pretty weak. I really have no idea where this guy came from, and given how invisible he was in the episode, I can’t say I find him all that scary. Complaints aside, though, wow, Hyun and Sun Ho’s reunion was pretty heart-breaking, as was seeing how defeated Hyun looked at the thought that he had failed his little brother. It did appear as if a reconciliation might be in the works, but I can’t help, but think that Joon Ho has something planned to destroy it. I guess we’ll find out next week. In the meantime, Ji Ahn continues to be awesome. I love these two together. Haven’t watched it yet, but sneaking a comment just like yesterday in my office. Ji an continues to be as amazing as a person could be. I love that she is the only smart cop who is able to put two and two together and figure out who Min is. Its a huge revelation to her, who never suspected Sun Ho to be Min. I have yet to watch the reunion but by the way you are wording it, it must’ve been quite heartbreaking. Plus Hyun has never cried. I would love to see the bromance. The real kind. Joon Ho is a creep. I won’t talk about him here. I watched it!!!!!! Bromance ftw!!!!! And Hyun’s falling smile whenever Ji an asks whether he is laughing at her is too cute! I dunno, but these three characters are making me squee in high pitch! Does anyone else notice that Ji An was holding her phone upside down at the last scene when Hyeon calls her!!! We felt as if he was pounding on our chest… bump…bump… bump….. its felt familiar to some of us, ironically. there were (are) moments in some of our lives, when we discovered some irrevocable grief mistakes we made, or hurt someone dear to us, or lost someone without having the chance to say sorry…. These were the moment, we did the same as Hyun, to lightly say “I wish to die”… isn’t one sense exaggerating, we do not have the courage to die yet, or simply we realised we deserve to live in despairs to suffer the torments forever griefs in regrets. S.I.G. carried the scene thru (just like what he delivered with “the King’s face”), without a sense of pretends, not overdo it with “hunk-styles howling wailing”, not putting up a big noisy show of emo…. That single one pound on the table first, was intense and deep, can felt the echo thru the wood (or metal whatever) up his arm, round the room. … then, … bump…bump…bump…. One, two… three. .. and you are dying to hold that hand at that first pound… “why don’t I just die together? … I as well die… as kill me….” ….No! stop! Where is Ji-An? Why don’t writer writes her in, to save the rest of the pounds…. No, I guess, Ji-an may allows him to continue with his self-flagellation, to let out the breaking point agony weights on his heart…..So, Ji-an, if she was around, she may just allows him to pound a short while, then hug him from behind much later on….. there is just that much a person can bear, before he breaks…. and he wasn’t even sobbing yet…. Yeah, there were tears, but he was even breaking yet, into unreserved weeping…. he was still holding it in, holding on…. Because he suddenly realised he has no time to grief and self-reproach. He need to race against time to stop Min in further self-destruction. True love for a brother or a girl, will put aside your own grief or interests, and focus on what he/she urgently needs at the moment. thus, he seek for redemption, not so much as for himself, to bridge the trust that was broken, … nor to save a relationship… he just want to save Min, from Min himself, for Min himself. the sky the limit, S.I.G., soar! I loved this kind of girl. Knows when to wait, and when to stop waiting. When to keep silent, and when to break thru and force him to hear what he should hear. “I speak as someone closed to Hyun”… he needs to realised that, he indeed has SOMEONE closed to himself too. What he needs isn’t a solution, he infact, very much capable of finding the solution, what he needs, is the courage to carry out that task, and the hands and heart of a loved one, a closed loved one, is that very energy , that give his hand that push to carry out that task. So, her blinking tears “you were stuck in this damned place in such young age”… and that envelope long hug (some pats, with a soft kiss on his shoulder), an understanding smile, were that simple help Hyun needs, to walk thru that dark valley. Most often, we don’t ask for solutions or help, because we actually knows what we should do, in dark valleys. “a closed one, who understands, and loved us” is all we need. “thank you, Ji-an.”hyun purred, We all behind our laptop, gratified by that pat on her forehead. yes, we too, are glad, that his redemption has begun. Thus, when he recalled LJH and Min mentioned mafia will make him suffers by living in griefs over death of his most precious loved person… he thought of Ji-An immediately,.. now then he realised, and we felt so “blessed” that he finally realised, we did long long ago.